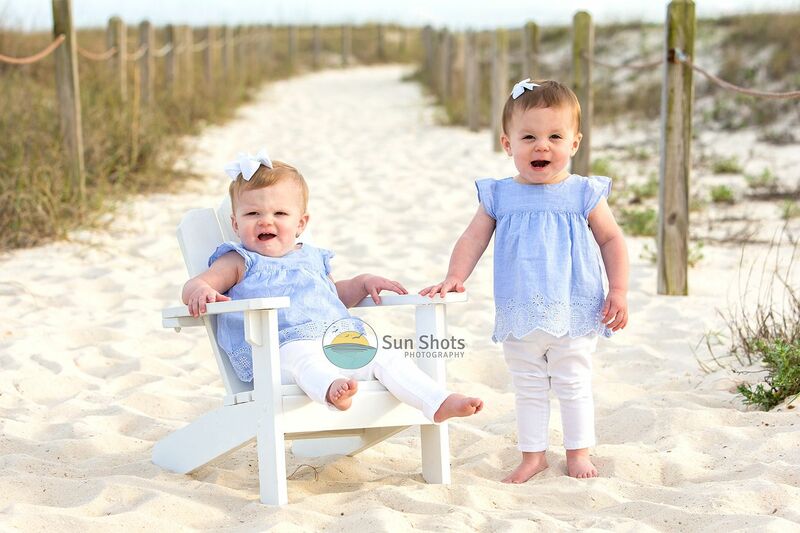 These two little cuties stole our hearts at last night's sunset session. They were so much fun to photograph. On spring break this week, they were really enjoying themselves. The "Nana" said they couldn't keep the oldest out of the water. What fun it must be to be that age at the beach, surrounded by unconditional love, from the whole family. Thanks, guys for sharing a little family time with us. We are so proud that we got to take a glimpse into your life and the love you all have for these two beautiful girls. If your family is coming to the coast this spring or summer, we would love the opportunity to capture your family story as well. We have limited slots available, so give us a call today. We can be reached at (251) 968-2119 or via our main website at www.sun-shots.com. We are a husband and wife team, and we are full-time professional beach portrait photographers. We have devoted our lives to capturing your story, so please let us have the opportunity to tell it. Proud members of the Professional Photographers of America and our local Chamber of Commerce, we are here to serve your family on your vacation in paradise with Orange Beach Photography. Between the two of us, we have over 25 years of combined professional experience in family beach photography. We service Gulf Shores, Fort Morgan, Orange Beach, and Perdido Key. We specialize in couple photography, family portraits, and senior sessions. Spots are extremely limited, so please take a minute and contact us today. Professional beach photography is limited to two sessions a day, sunrise and sunset. With many options and packages to choose from, we are positive we have exactly what you are looking for. What will you remember?